Our guidebook forgot to mention that Shanghai is a madhouse. A warning for us rookie visitors would have been nice. 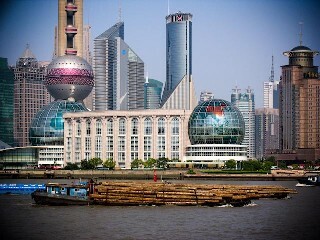 It was my first time to Shanghai (and, in fact, my first time to Asia) and my husband and I were completely shell-shocked. Nor did it mention the hagglers. There was no escaping the tourist brand with my blonde hair and fair skin—and for that we paid dearly. We couldn’t walk two feet in most tourist areas without being accosted by somebody hawking a knock-off Rolex or fake Gucci and Prada bags. Despite the women washing and hanging their underwear in the street or the guy who sets up his "bike shop" in front of the grocery store under an old, dirty sleeping bag propped up with two bamboo sticks. Or the barber who has moved his barber chair into the street where he shaves shirtless men and, judging by the size of the mound of hair in the street, doesn’t sweep but instead waits for the rain to wash the fallen hair down through the gutters. But even amid all of the frenzy on the streets, you do get a sense that you’re getting a glimpse of the future with the big, modern tower and skyscrapers that light up at night in Pudong. From the top, you’ll get a valid view of the city. If you take the elevator to the restaurant at the top of Three on the Bund (the most expensive real estate in Shanghai) and order a martini outside on the deck, you can enjoy Shanghai in all its 21st-century glory. From there, the city looks incredibly advanced. More so than New York. It’s every photographer’s dream location: boats lit with neon signs and string lights cruising down the Huangpu River in front of the space-age Oriental Pearl Tower as it flashes billboards on the skyscrapers next door. In fact, it’s quite possible that there’s actually more light in Shanghai at night than there is during the day. And it’s all changing so fast. The city IS moving toward a more futuristic incarnation—with taller buildings and less hanging laundry. 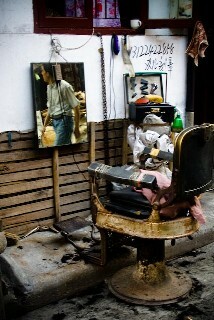 I fear if we don’t go back soon, we may never again see the Shanghai we grew to love … the barber in the street … the laundry dripping from the sky. 1) Your guidebook might tell you that taxi drivers don’t speak English and that you should carry with you your hotel’s address written in Chinese. But that’s not enough, as some taxi drivers can’t read. Ask your hotel’s concierge to mark the location on a Chinese map and bring that with you, too. 2) Ask your hotel to write these two things on separate pieces of paper before you go out to eat: "Can we have a few minutes to look over the menu?" and "Can you recommend some things for us to try?" With so many interesting foods to choose from (hmm, should I try the crab sperm or the snake’s blood?) you’ll want time to digest the menu before you order. It’s also good to try new things. I pronounced the jellyfish awful but the turtle shell jello not bad. 3) Avoid chicken. Most chicken dishes, unless indicated otherwise, were served to us with bones—not whole bones, but shards of bone (as if they attacked the chicken with a meat clever and hacked at it until the whole bird, bones and all, was in pieces small enough to eat with chopsticks). 4) If it’s wrapped in dough and/or some kind of pastry, it’s probably good. And if it wiggles when you shake it, it’s probably not. Obviously, your tastes may differ from mine. But this rule of thumb served me well and could do the same for you during those first few days when you can’t order chicken and you don’t recognize anything else on the tables next to you. If you’re traveling with kids: the Chinese acrobat show by the Shanghai Acrobatics School & Troupe is amazing and worth every penny. And the Flower, Bird, Fish and Insect Market has enough creepy crawly stuff to keep little ones entertained for hours. My advice for travel writers: Just wander. All the main tourist attractions—the Oriental Pearl Tower, the Tourist Tunnel, the Bund, Yu Gardens—aren’t worth even their incredibly cheap taxi fare. There’s a much better market across from the Flower, Bird, Fish and Insect Market with fewer tourists and therefore fewer hagglers. You’re more likely to find a local story there (and better prices). And do get out and enjoy the restaurants without English menus. Have your server write down in Chinese the name of what you’re eating and ask your hotel concierge to translate for you later. 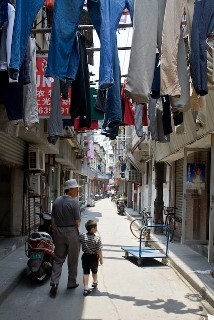 My advice for photographers: Get off the beaten path and bring your camera down those side streets off Nanjing Road. If you decide to take a day trip to one of the canal towns or water villages, hire your own driver and don’t go with an organized tour. The hour-plus ride to Suzhou is just as photogenic as the villages themselves (if not more so) and you’ll want to be able to stop at your leisure.